In the history of terrible mistakes, accidentally dropping a nuclear bomb on your own country has to rank pretty damn high. That's exactly what happened when a really, really stupid accident resulted in America tossing an atom bomb on rural South Carolina. On March 11, 1958, an Air Force B-47 Stratojet was making its way to the United Kingdom from the Hunter Air Force Base in Savannah, Georgia. It was sent out with the intention of helping out in Operation Snow Flurry, but it never made it. As the plane was cruising over South Carolina, the pilots noticed that a fault light in the cockpit was indicating a problem with the locking pin on the bomb harnesses in the cargo bay. You see, back then, the plane was required to carry nuclear weapons at all times just in case a war broke out with the Soviet Union. The nuclear bomb in question was as 26-kiloton Mark 6, even more powerful than the Fat Man bomb dropped on Nagasaki. Great idea, right? Air Force Captain Bruce Kulka was acting as the navigator on the flight and decided to go back and check out the problem. While pulling himself up from the plane floor, he reached around the bomb to steady himself, but ended up grabbing the the bomb's emergency release pin instead. Whoops. Kulka could only look on in horror as the bomb dropped to the floor, pushed open the bomb bay doors, and fell 15,000 feet toward rural South Carolina. 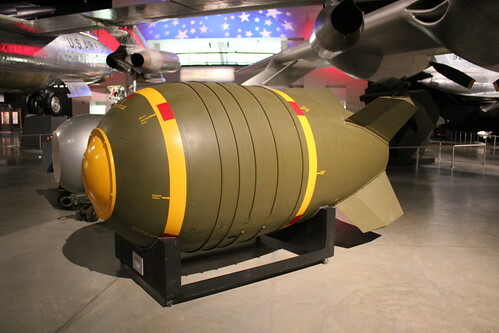 Fortunately for the entire East Coast, the bomb's fission core was stored in a separate part of the plane, meaning that it wasn't technically armed. Unfortunately for Walter Gregg, it was still loaded with about 7,600 pounds of traditional explosives. The resulting explosion leveled his house, flattened a good section of the forest, and created a mushroom cloud that could be seen for miles. When the dust had settled, the bomb had caused a 25-foot-deep crater that measured 75 feet wide, and while it had injured a number of Gregg's family members, miraculously, not a single person was killed. While you may have never heard about the strange tale of the Carolinas' first brush with a nuke, the crater still exists just off of South Carolina Highway 76, marked by a historical plaque. Visitors can trek down the path that leads to the Mars Bluff Atomic Bomb Crater where they can see the impact site and read an informational board complete with a mock up of the bomb's size. Just make sure you ask the current property owners for permission before you head down the trail. They're generally pretty keen to show the crater off. Notice how I said this was just the Carolinas' first brush with a nuclear weapon? There was an even scarier accident that happened just a bit north a few years later, and it's one that no even knew about until last year. Thanks to the Freedom of Information Act, investigative journalist Eric Schlosser discovered that on January 23, 1961, a B-52 bomber broke up mid air, dropping two Mark 39 hydrogen bombs over Goldsboro, North Carolina. While one bomb never activated, the second one had its trigger mechanisms engage and its parachute open, two things that only happen when the bomb is intended to explode on target. In fact, only one low-voltage trigger kept it from detonating upon landing. After that, you're probably looking for the best places to ride out the impending (accidental) nuclear apocalypse. Let me suggest checking out the Minuteman Missile National Historic Site, the The Greenbrier Nuclear Bunker, or the Satsop Nuclear Plant, all fine places to set up the perfect fallout shelter.